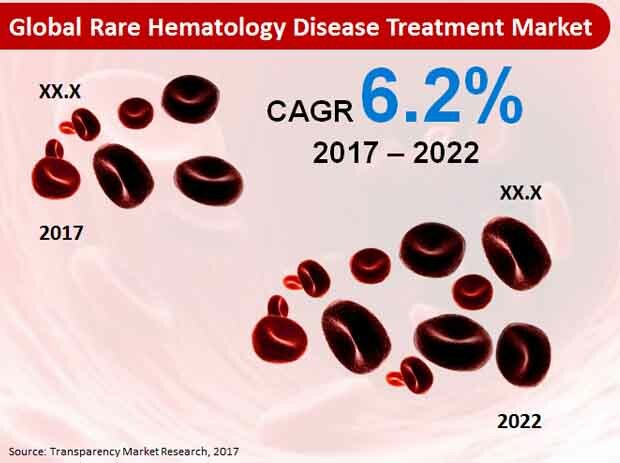 The top six rare hematology market players are Bayer Healthcare, CSL Behiring LLC, Novo Nordisk A/S, Alexion Pharmaceuticals, PRA Health Sciences, and Shire plc, who are trying to enhance the scrutinizing process. These major companies are aiming towards deep research concerning microbiology and genetics. These companies are trying to cure the research within a shorter period of time. These companies have found a way to advance the new technology in order to obtain faster recovery. According to Transparency Market Research, the worldwide rare hematology market is anticipated to rise at 6.2% of CAGR, with a value of over US$16000 mn by the end of the forecast period which is from 2017-2022. Presently, the global hematology market on the basis of age is anticipated to show the highest rise in terms of revenue, valuing over US$3000 mn. Regionally, North America holds the leading segment due to rise in number of geriatric population. The U.S. is known to contribute the larger share in the region. On the basis of various micro-economic and macroeconomic factors the growth of the global rare hematology depends. Frequent blood related illnesses such as sickle cell anemia, myelomo and leukemia adds to the growth of the market. Rise in need of conducting diagnosis in lesser period of time made the companies to focus on more advanced techniques. Rise in number of clinical trials which are yet to be approved are anticipated to bolster the growth of the market. Rise in awareness among consumers about blood related diseases by caregivers, patients , advocacy groups, and researchers is expected to profit the drug makers as it makes the patients enroll for the clinical trials. Advocacy groups like Myloma Foundation, American Society of Hmatology, and International National Hemophilia Foundation are known to extend their helping hands by providing support and resources for the patients, clinicians, and caregivers. Government rules and regulation regarding the blood related diseases is the other factor that is helping every country to fight against these disorders and help the market to grow. Rise in incentives to various non-profit organization is helping them to look for better treatment, thus pushing the growth of the market. Absence of backing from disease-specific foundations is expected to deter the market. Disease-specific foundations have not yet proved to play an active role in helping research and development. Numerous drugs which were decided for treating the blood-related diseases are yet to be approved by the FDA pipeline for the treatment. Rise in need of various approved drugs for the treatment of the rare hematology market has steered the investors to provide more funds to the researchers’ team to develop better treatment, thus threatening the market during the forecast period.